Visiting Lebanon, Secretary of State says Lebanese people need to stand up to Hezbollah. 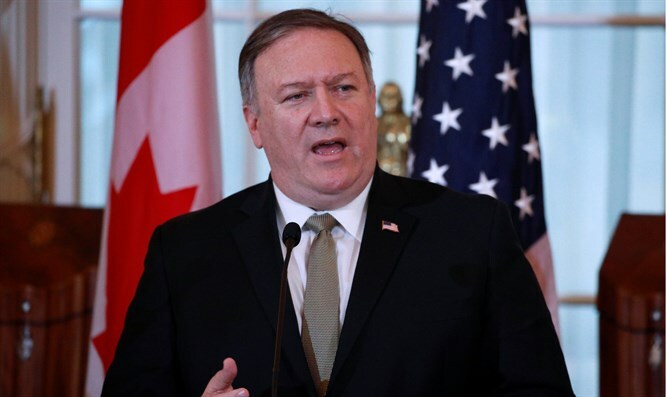 US Secretary of State Mike Pompeo on Friday called on the Lebanese people to stand up to Hezbollah’s “criminality, terror and threats,” and claimed US sanctions on Iran and its Lebanese Shiite ally were working and that more pressure on them was forthcoming, The Associated Press reported. The US ambassador to Lebanon recently expressed concerns over Hezbollah’s growing role in the new Cabinet, saying it does not contribute to stability. Hezbollah is blacklisted as a terrorist organization by the West and even by some Arab countries, but some of those designations, most notably in the EU, make a distinction between Hezbollah’s “military wing” and its political arm. Britain recently blacklisted Hezbollah’s political arm as a terrorist group, following warnings by MPs that the UK had drawn a false distinction by proscribing Hezbollah’s military wing but not its political side. This loophole in British law has allowed participants in the annual Al-Quds Day to march through central London to wave the Hezbollah flag, featuring an assault rifle.